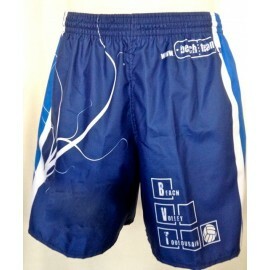 The official Beach Athlétic Club of Mulhouse shorts that you can personnalize. Made in France and 100% polyester, your shorts is adaptable to all your desires. Available from XXXS to XXXL, you can also personalize it by adding our name! (see below the way to proceed for personalization) and, moreover, choose between many options like the lenght : short for competitions (4 inches above knee) or long (knee-length). You can add your name/nickname which will be written on the front of the left leg. If you want this option, please fill the correct square.